A Bathroom is any room in your home that has a toilet. It can be a 'full bath,' which has a toilet, sink, and bathtub or shower. Or it can be a 'half bath,' which has only a toilet and sink. 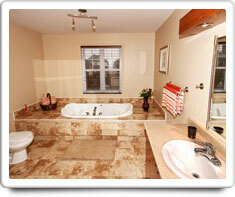 Typically a bathroom will have tile on the floor, which makes the room easier to clean. Bathroom shower stalls may be lined with ceramic shower tiles that are held together with a mortar called grout. Plastic shower stalls may have grout or caulk at the seams where the plastic meets the wallboard. Similarly around bathroom tubs. Shown in the 'Routine Care' section are the recommended routine maintenance tasks for your bathroom. The 'Q & A' section shows answers to common questions. And the 'Articles' section provides helpful articles about your bathroom.